A Latino flair will mark the World Meeting of Families and visit of Pope Francis – the first Latin American pope – thanks to the launch of the Latino Papal Fund for the families’ congress in Philadelphia this September. 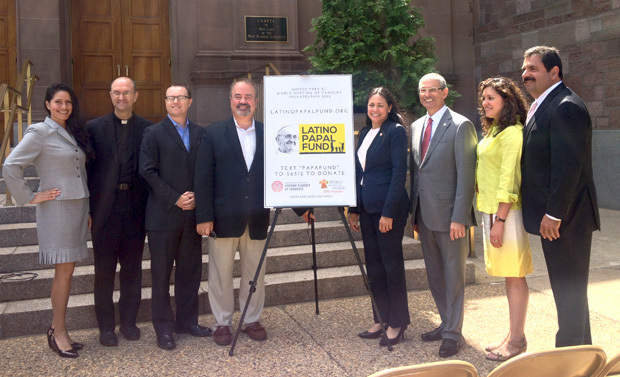 The Greater Philadelphia Hispanic Chamber of Commerce announced the fund at a press conference Monday, June 29 at the Cathedral Basilica of SS. Peter and Paul. The mobile giving platform will help fundraising efforts for the World Meeting of Families, Sept. 22-25. “The Latino Papal Fund is a unique fundraising effort to make possible the visit of Pope Francis” on Sept. 26-27, said Varsovia Fernandez, president and CEO of the Hispanic chamber of commerce. The fund is an opportunity to “show Pope Francis how invested Latinos are” in the upcoming meeting and visit, she said. Fernandez encouraged Latinos around the area to donate to the fund. Its goal is to have 100,000 area Latinos contribute at least $5 each, for an estimated total contribution of $500,000. Fernandez also mentioned that a recent Pew Foundation study indicated that 40 percent of all American Catholics are Latino, noting the importance for Latino Catholics to contribute to the fund in order to meet the $45 million fundraising goal for the World Meeting of Families. The World Meeting of Families is expected to generate roughly $400 million in revenue for the city of Philadelphia and surrounding suburbs. “Seldom does an event have the potential to lift up our communities economically like that,” Liceaga said. Contributors to the Latino Papal Fund can text PAPAFUND to 56512. Minimum contributions are $5, and the one-time donation will be added to a donor’s wireless bill or a separate credit card. Standard messaging and data rates will apply. Donations can also be made through the Latino Papal Fund website, www.latinopapalfund.org, and will be accepted from June 29 to Sept.30.